Mystery (pronounced mis-tuh-ree, ) is a genre of literature whose stories focus on a puzzling crime, situation, or circumstance that needs to be solved. The term comes from the Latin mysterium, meaning “a secret thing.” stories can be either fictional or nonfictional, and can focus on both supernatural and non-supernatural topics. Many mystery stories involve what is called a “whodunit” scenario, meaning the mystery revolves around the uncovering a culprit or criminal. I stared down at the corpse, whose face was covered by a ski mask. Next to the body was a pile of money. The biggest pile of money I had ever seen. Attached to the body was a note. I tore it from the dead man’s jacket, and read it slowly, over and over, trying to take in its words: Get rid of this and the money is yours—I will deliver the other half after the job is done. Sincerely, F. What I did next was something I would grow to regret for the rest of my life. The passage above sets up a mysterious situation for the audience to follow. It begins with a crime—a murder—and ends with an ominous hint to the audience. However, the passage does not at all reveal what the narrator chose to do and would later come to regret. A book featuring this passage would likely end with the solving of the murder and the revealing of the true circumstances of the narrator’s decision. Mysteries are defined as either nonfictional or fictional, and there are further divisions within each involving the combination of other literary genres. Fictional mysteries are stories that can be realistic or fantastic in nature, but are not specifically based on true events. They overlap with other literary genres, such as fantasy (most commonly to create gothic fiction), thrillers, horror, crime fiction, historical fiction, and even science fiction. Detective fiction, which explicitly features a detective solving a crime, is perhaps the most popular form of fictional mystery, however, it is nowadays considered a separate genre of literature. Nonfiction mystery books cover a wide range of topics that address true events, often involving mysteries of history, science, religion, magic, the supernatural, or the afterlife. For example, there are many works on unsolved crimes, unexplainable disappearances of people or groups of people, strange sightings like Bigfoot, the Lochness Monster, and UFOs, or mysterious places that seem to be haunted. Nonfiction mysteries are also a very popular genre for documentary and reality television shows, often focusing on mysteries that remain unsolved or unexplainable. *An important difference between fiction and nonfiction mysteries is that fiction mysteries almost always end with the mystery being solved, while nonfiction mysteries typically exist to address mysteries that remain unsolved. Mysteries began to gain popularity in the Victorian era, mostly in the form of gothic literature, which was primarily for women. Since then it has developed in both form and reach, and has become a widely read genre among male and female readers of all ages. Mysteries are important because they feature topics that are usually both fascinating and troubling to the human mind—unsolved crimes, unexplained questions and events in natural and human history, supernatural curiosities, and so on. 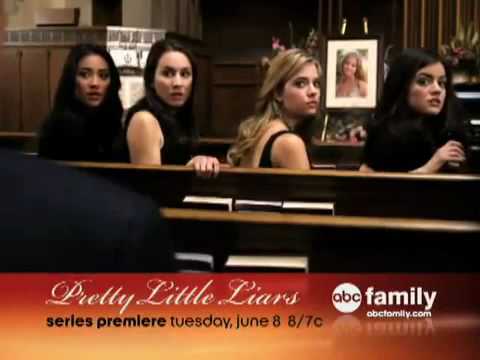 Here, the writers immediately establish the show as a mystery by opening the series with the night that Alison went missing. Later the audience learns that Alison was declared dead when a body was found, however, the mystery continues as her friends receive messages and threats about personal things, which are always signed from “A.” The entire series centers on the mystery of A’s identity and the circumstances of Alison’s disappearance and murder, and, the possibility that she is still alive. For nearly twenty years the nonfiction mystery television series Unsolved Mysteries entertained its audience with stories of unexplained events and crimes in the United States. It featured true accounts of mysteries of every nature—crime, murder, UFOs, missing persons, separated family members or friends, ghost stories—as told by real witnesses, historians, detectives, and so on. Because of its popularity and ability to reach the public, the show was also known for occasionally helping to solve crimes and mysteries—after episodes aired, viewers would sometimes contact the show with information that helped solve a crime, find a missing person, or reunite people who had been separated. Unsolved Mysteries would share these success stories in later episodes, often updating the audience weeks, months or years after a story originally aired. Another item had been added to that constant and apparently purposeless series of small mysteries which had succeeded each other so rapidly. Setting aside the whole grim story of Sir Charles’s death, we had a line of inexplicable incidents all within the limits of two days, which included the receipt of the printed letter, the black-bearded spy in the hansom, the loss of the new brown boot, the loss of the old black boot, and now the return of the new brown boot. Holmes sat in silence in the cab as we drove back to Baker Street, and I knew from his drawn brows and keen face that his mind, like my own, was busy in endeavouring to frame some scheme into which all these strange and apparently disconnected episodes could be fitted. Here, Watson is running through some of the clues to the victim’s death in his head. He also expresses his familiarity with Holmes’ character and skills by telling the audience that he knows the detective is finding the connections between all of these clues in his mind; which will inevitably lead to the solving of the mysterious murder. 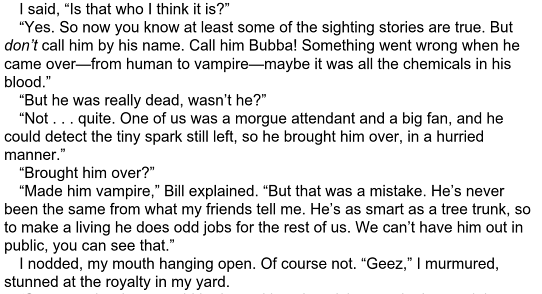 “Bubba” is supposed to be Elvis, who Bill claims was turned into a vampire on the night he died decades before. Harris lets the audience in on little secrets like this and references them throughout the series. Each novel Sookie faces a new mystery, and she always plays a substantial role in solving it. Like many mystery series, each Southern Vampire Series book could essentially exist as its own standalone story, as it introduces and solves a new mystery in each novel; however, the true popularity lies in the following of Sookie and her life. Detective fiction is considered its own genre of literature, though it is technically a subgenre of mystery. These stories feature a detective investigating a situation or a crime, commonly a murder. It is popular form of crime fiction and gothic fiction, where the protagonist is most often an official detective investigating a crime, or a person who acts as an unofficial detective to solve a more personally relevant mystery, respectively. In conclusion, fiction mysteries engage readers in an unexplained event or situation from its occurrence to its resolution, while nonfiction mysteries allow authors to explore unsolved or unexplainable mysteries of the world. The genre can be successfully combined with many other styles of literature to create engaging stories for audiences of all ages.